KOKOMO, Ind. – The Prospect League Championship Series is set to begin Thursday, August 9! This year’s series features a first-time PLCS participant in the Kokomo Jackrabbits, while the REX enter the best-of-three series for the second time. With the best regular-season record in the Prospect League, the East Division Champion Kokomo Jackrabbits own home-field advantage in the league’s deciding series. 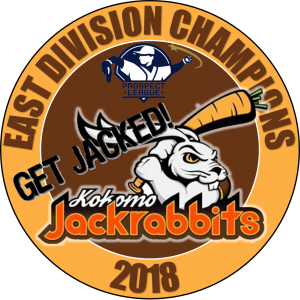 The Jackrabbits finished the season 37-22, they won the final two games of the East Division Championship Series against Chillicothe to advance. The REX, won the West Division Championship and advanced to the PLCS after amassing a regular-season record of 35-24 and then defeated Danville two games to one in the West Division Championship Series. Kokomo and the REX played each other three times during the regular season. The REX won all three of the games and outscored Kokomo 20-12. In the three-game season series, the REX hit .302. Kokomo hit .250 against the REX during the season. So far in the playoffs, the REX are hitting .284 through three games and have scored 18 runs on 29 hits. Kokomo is hitting .257 and scored 15 runs in its three first-round games. REX pitchers have been the best of the four playoff teams, compling a 2-1 record with an ERA of 3.67. REX hurlers have given up 12 runs (11 earned) on 27 hits, walked only four and struck out 22 over 27 innings. Kokomo’s pitching staff is 2-1 in the playoffs with an ERA of 3.81. Jackrabbits pitching has given up 11 runs (all earned) on 28 hits, walked nine and struck out 24 through 18 26 innings. Kokomo has not made an error through its first three playoff games, while the REX have made three errors and have given up one unearned run in playoff action. Game one of the Prospect League Championship Series is Thursday at Bob Warn Field in Terre Haute, Ind., as the REX host the Kokomo Jackrabbits at 7:05 p.m. After a travel day Friday, Kokomo hosts the REX in game two Saturday at 7:05 p.m. and, if necessary, Sunday at 3:05 p.m. at Kokomo Municipal Stadium.